Iron Kitchen 鐵廚, owned by Bubble Waffle Cafe 雞蛋仔餐廳 (雞蛋仔集團), offers personal-sized teppanyaki hot plates along with the popular mix & match soup noodle combos. 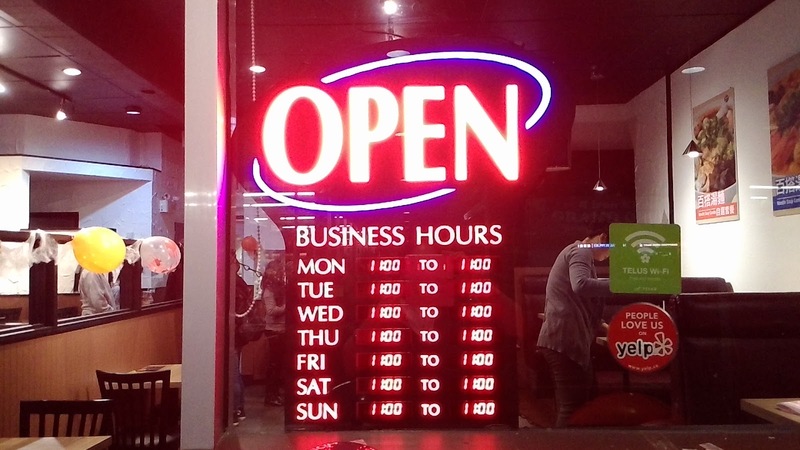 Its current hours are 11am-11pm, seven days a week. 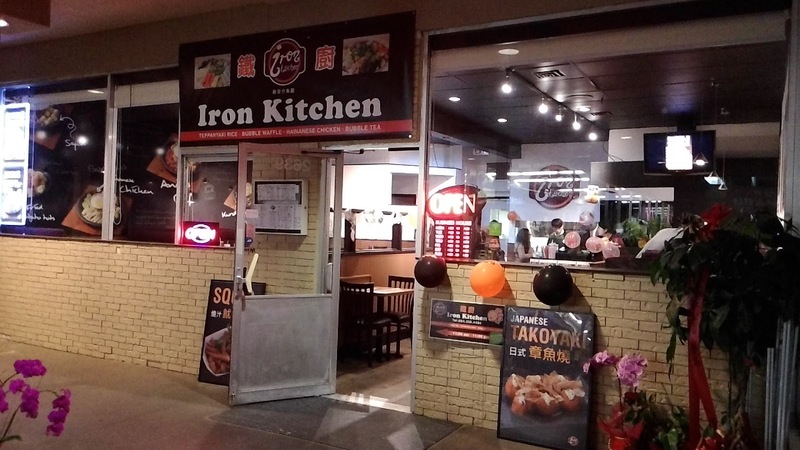 We thought this place is a Taiwanese restaurant, but we were wrong. Other than a few snack items on the menu and a list of bubble tea drinks, there's nothing much "Taiwanese" about it. Each of our combos came with a drink. 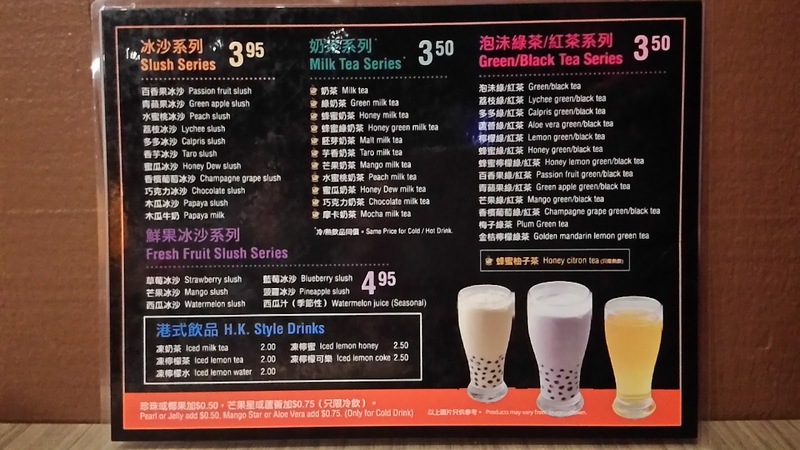 We opted to pay extra to substitute the beverages to bubble tea selections. 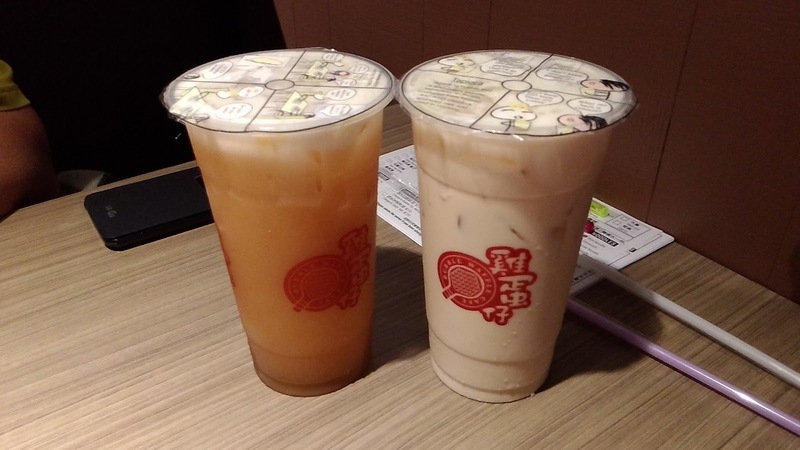 Buddha Boy's Peach Milk Tea 水蜜桃奶茶 was pretty much a HK-style milk tea with very light peach taste, almost undetectable. My Black Tea 泡沫紅茶 had just the right level of sweetness, however, I'd prefer a stronger tea. 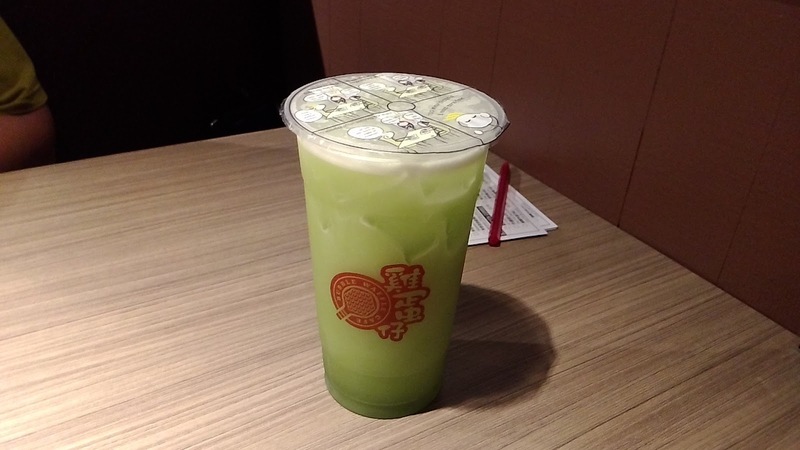 Little Lee went with a Green Apple Green Tea 青蘋果綠茶. 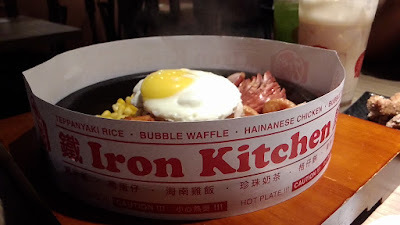 喇沙湯, sliced angus beef 安格斯牛肉, sliced kurobata pork 黑豚肉 and flat rice noodles 河粉. 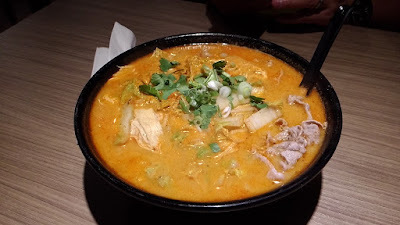 According to Little Lee, the broth had a good spicy kick and the portion was quite generous. Knowing my husband, the meatatarian, extra meat was added to his teppanyaki plate of Homemade Duck Breast Combo 秘製鴨胸肉鐵板套餐. While the menu stated only $1.50 to add extra meat, this did not apply to the duck meat. We do not believe that the duck breast was homemade. The meat looked and tasted like it's been cured, similar to those smoked turkey meat sold at T&T (which is supplied by an external supplier). The combo offered a choice of rice, egg noodles or udon and Buddha Boy opted for white rice. 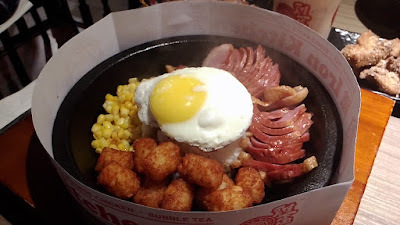 The plate also came with tater tots, corn and a sunny-side up egg. I also added extra meat to my teppanyaki plate of Boneless Hainanese Chicken with Rice 無骨海南雞飯. Again, the stated $1.50 for extra meat did not apply to this combo. The steamed chicken was moist and lightly seasoned. The soy drizzle reminded me of the soy sauce used for pot rice 煲仔飯. The yellow rice had a light gingery taste. 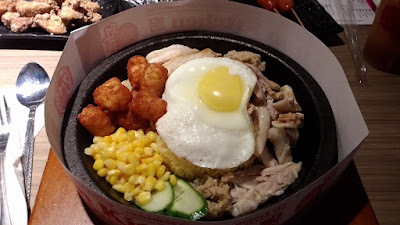 Other than tater tots, corn and a sunny-side up egg, the plate also had slices of cucumber and minced ginger (commonly used for Chinese barbeque meats). Now, with our two teppanyaki combos, we can order snack items at discount prices. Not exactly sure if the discounts apply to noodle soup combos...we will ask next time we visit. At a discounted price of $4.95 (regular price $5.95), the Salty Chicken Nuggets 鹽酥雞 lacked flavors every which way. 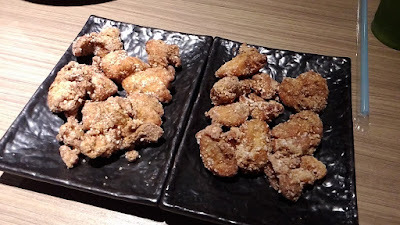 The overly bland chicken had a thick coat of batter and was overcooked. Honestly, what happened to that blend of five spice, salt and pepper? And, where was the basil? 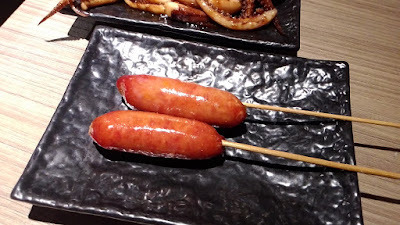 Funny enough, we enjoyed our order of Taiwanese Sausages 台灣香腸. While not very juicy, these were plump and not overly sweet nor salty. Links were a bit small but good enough for the discounted price of $2.50. Actually, even at its regular price of $3.50, we'd order these again. DO NOT ORDER THIS. I repeat, DO NOT ORDER THIS. At a discounted price of $3.95 (regular price $4.95), this order of Homemade Squid 秘製魷魚 looked pretty decent huh? Well, this was pretty much left untouched after our first bites. 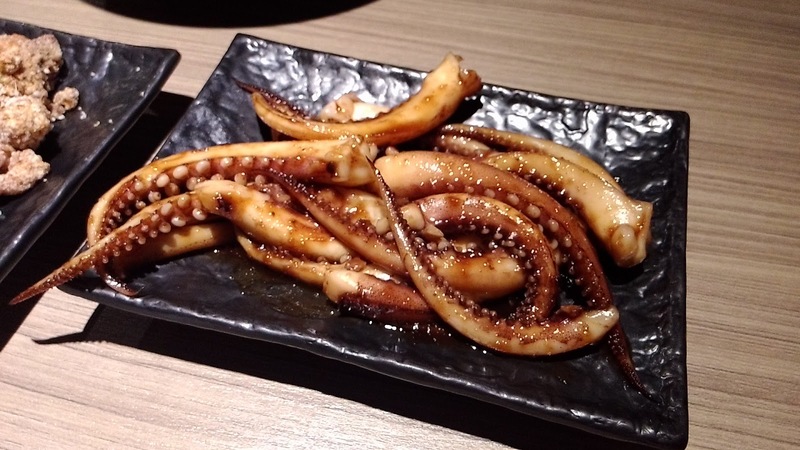 The squid tasted odd, in a very fishy way. The "house blend" sauce was very salty, most likely used to cover up the fishy tentacles. Buddha Boy is a sucker for mexi-fries. He got excited when he saw the menu offering tater tots with different flavor choices. 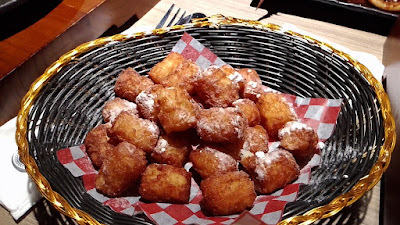 Unfortunately, big boy was quite disappointed with his order of Potato Tots with White Cheddar 脆薯寶加白車打粉. Simply store-bought tater-tots with flavored popcorn powder sprinkled unevenly. Not recommended. 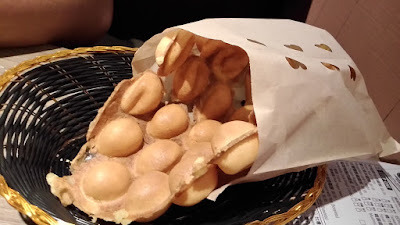 What we enjoyed the most was the loonie special of Original Flavor Bubble Waffle 原味雞蛋仔. 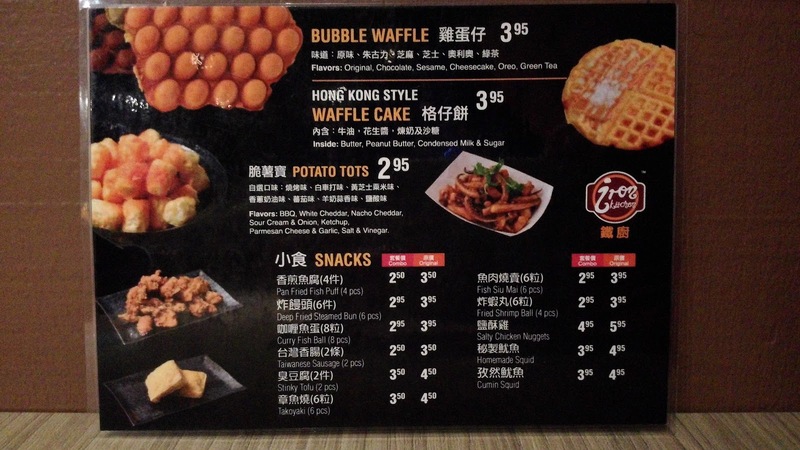 Yes...$1 bubble waffle with purchase of any combo meal. While these could not compare to our favorite stall in Yaohan Centre in Richmond, but these were still pretty decent. The bubble surface was crisp and dry with an airy yet firmer-than-usual inner texture. The mix contains less tapioca, which offers less chewy inner texture. Of course, consuming these right when it's served is always the most ideal, however, we were surprised that these bubbles still held up well after it turned cold. 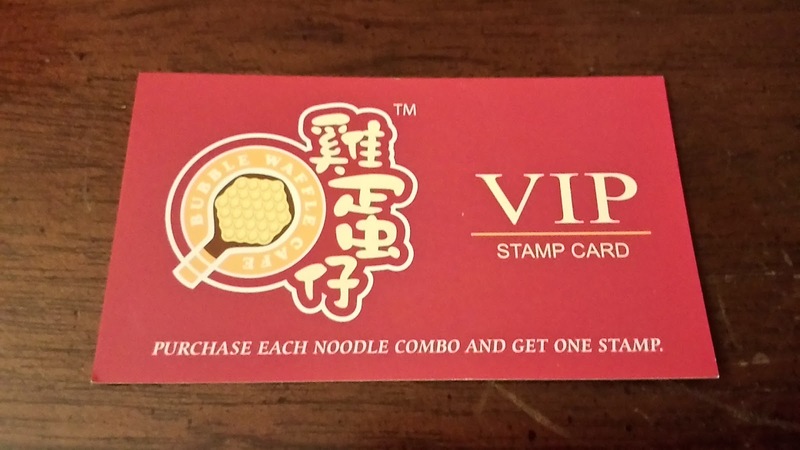 Just like other Bubble Waffle Cafe restaurants, stamp cards are offered and used here. 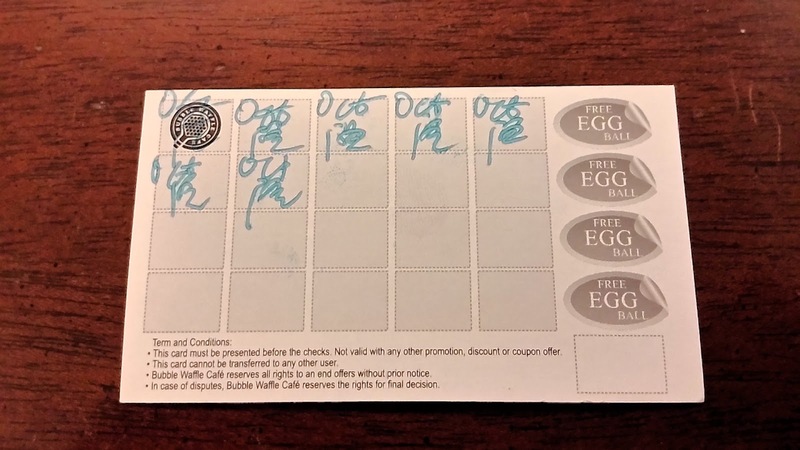 We were told that we can redeem the card at any of their locations. Service was pleasant at first, but slowly deserted once our food arrived. The few servers all bunched up to chat by the drink bar. Would we return? 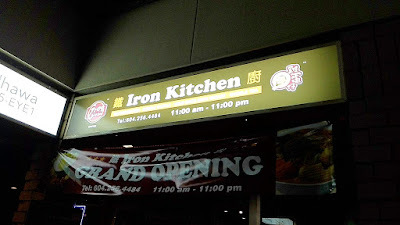 Yes, it's close to home and the food was decent for its price points. Personally, I thought the mix & match soup noodle combos are better deals than the iron plates.